New for 2018, OASE Germany have released the ProfiClear Compact L pond filter for Koi ponds, swimming ponds and large ornamental fish ponds up to 140,000 Litres (31,100 Gallons). The Compact L filter incorporates the same automated drum unit for the popular ProfiClear Premium drum filter but also incorporates Hel-X biological filter media within the same compact module. 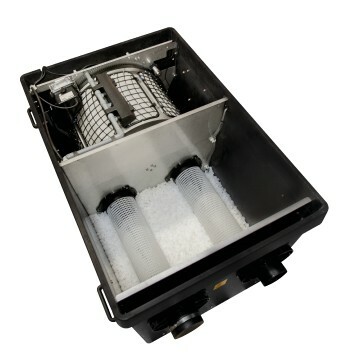 The all-new Compact L filters are available in both pump fed and gravity fed guises. The Pump Fed version generally sits above the pond water surface level on dry land and a submersible pump is used to pump the water into the filter, with the processed water flowing back via gravity to the pond. 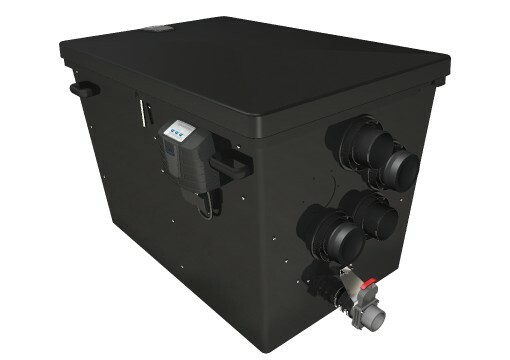 The Gravity Fed version is set virtually flush with the pond water level and is usually connected via bottom drains, with the water being pulled through the filter via low energy pumps on the filter outlet side, returning the processed water via the pump outlets back to the pond. The ProfiClear series of automated drum filters have revolutionised pond filtration over recent years, allowing debris and fish waste to be automatically screened out to particle sizes of less than the thickness of a human hair, offering gin-clear water clarity. The Hel-X 13 Biomedia offers superior biological filtration with the aerated media containing a huge surface area for beneficial bacteria to actively breed on. The new ProfiClear Pump Fed Compact L filter greatly reduces the footprint consumed by the filter system compared to the ProfiClear Premium modules, requiring only a direct filter-mounted Bitron Ultraviolet Clarifier, the AquaOxy 2000 Air Pump and solids handling submersible AquaMax Eco Premium Pump to complete the installation. Additional Hel-X filter media can be added to the filter module to further boost the biological aspect of the filtration. From a performance perspective, the OASE ProfiClear Premium Compact L (pump fed) filter can process ornamental ponds and swim ponds of up to 120,000 Litres (26,660 Gallons). 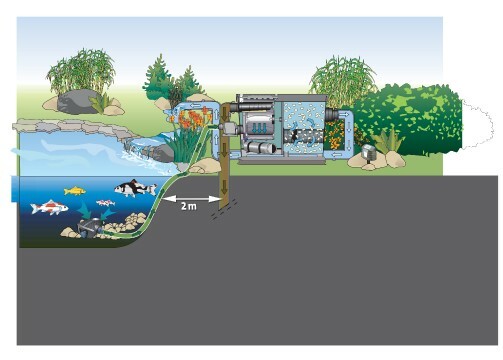 General fish ponds containing hardy small fish of up to 60,000 Litres (13,330 Gallons) can be catered for and Koi stocked ponds of up to 30,000 Litres (6,660 Gallons) can be serviced to high levels of water clarity. To complete the set-up in a pump fed scenario, we suggest the use of a Bitron Eco UV Clarifier (120w, 180w or 240w), OxyTex 2000 Aerator and an AquaMax Eco Premium 20000 pump to take full advantage of the maximum flow through rate of 20,000 Litres/Hour (pump fed version). In the case of the gravity fed scenario, the UVs (2 x Bitron Gravity UVC maximum) and pumps (2 x AquaMax Gravity Eco 15000 maximum) are mounted in the separately purchasable ProfiClear Premium Individual Module. 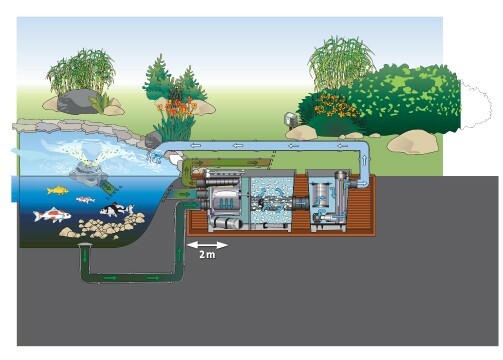 So if you are looking for a pond filtration system that is fully automated and at the cutting edge of aquatic technology, look no further than the OASE ProfiClear Premium Compact L. Need advice or guidance? Call Water Garden’s team of helpful experts on Portsmouth 02392 373735. We can ship to all UK destinations and carry huge stocks of OASE equipment.